These wonderful cachets and the descriptions were shared by Tom Michael. 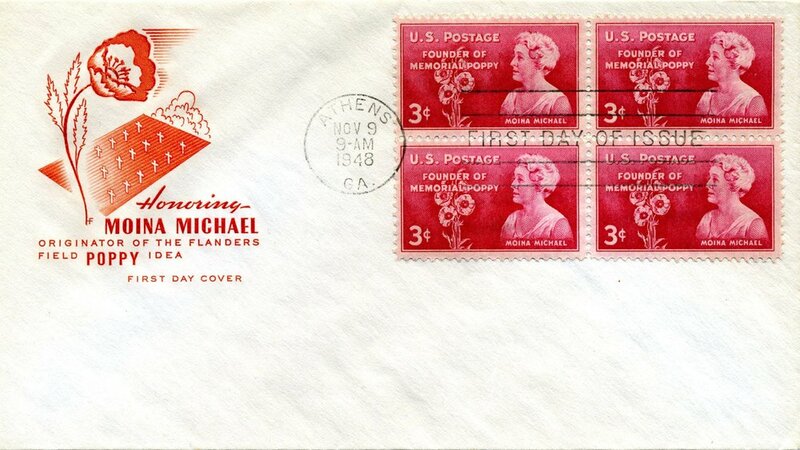 Commemorative envelopes, which are known as "covers" or "cachets" to collectors, that honor Moina Michael on the first day the United States issued her postage stamp. The text at the bottom of this one is very interesting. As anyone who has read The Miracle Flower should know, Moina sold the first flower on November 9, 1918. At the speech where the flower and torch symbol was unveiled in early 1919, Boy Scouts sold poppies. I guess Ms. Mary Hanecy originated the idea of selling them on the street, or selling them in Milwaukee. The emphasis on Milwaukee history in the text suggests that this particular cachet originated there, to sell to local collectors. So how this Milwaukee-centered envelope ended up being sent to a Brooklyn address deepens the mystery. Notice that this one has no address, so it never traveled through the mail on its own. This envelope was printed by, and cancelled for, a stamp dealer. Here's how first day of issue covers work: The date the stamp will be issued and the post office it will be issued from are announced months in advance, Stamp collector publications carry the announcements, and news outlets local to the post office of origin usually also make a big deal of it. Prior to the date of issue, collectors send self-addressed envelopes and the cost of postage to the postmaster at the issuing post office. 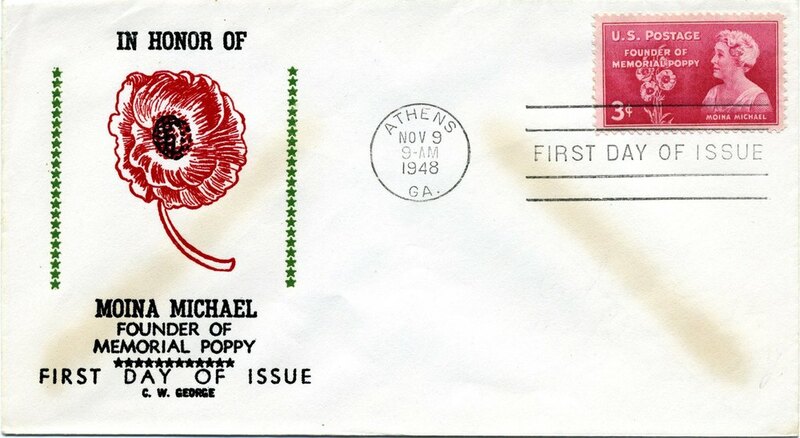 The collectors can use their own blank envelopes, commemorative envelopes purchased from a dealer, and sometimes envelopes they've decorated themselves. 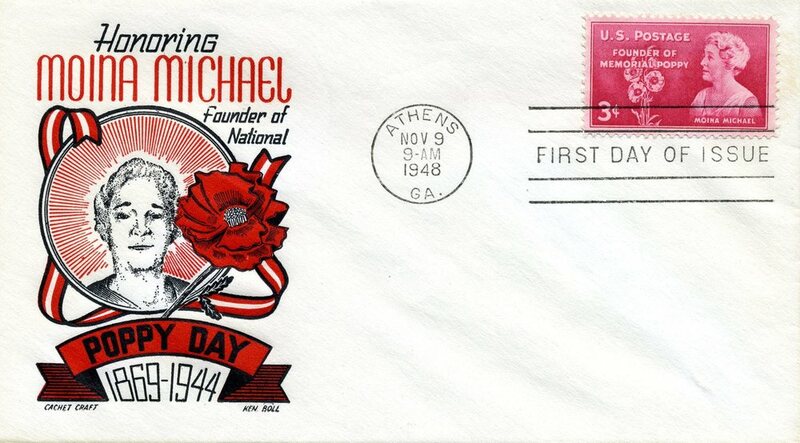 Dealers who specialize in stamp collectors often create and print their own commemorative envelopes. Some are sold in advance for collectors to send-in and use. Others are sent in bulk to the issuing post office, with a check for all the postage for the envelopes and shipping the stamps back. Those received in bulk are stamped, cancelled, and shipped back to the dealer in a box (which the dealer pays extra postage for, but it reduces wear and tear on the envelopes). Dealers then sell the unaddressed but cancelled envelopes to the collectors. The post office stamps and cancels all envelopes received in advance, but does not release them until the post office opens on the day of issue. That's why nearly all the envelopes in this series will be postmarked at 9:00 a.m. The post office received them in advance, and prepared them for release on the issue date. If an envelope was received on the day of issue for first day cancellation, it would be postmarked with a later time that day. Only the commemorative stamp and the first day cancellation are prepared by the post office. The various cachets (envelopes) are printed by private dealers or decorated, if at all, by individual collectors. None are "official." The next post in this series will go into why dealers create so many different commemorative cachets, and why some individual dealers create many different variations of their cachets. This full cachet has a couple of points of interest I'll note. First, like several cachets coming up in this series, it uses the "Buddy Poppy" slogan; but this is the only one to use the slogan and note that the phrase is also a registered trademark (look closely at the banner under Moina's head). Second is that while the engraving and color look quite similar to the cachet posted previously, they're from different companies: if you look hard you can find a signature on each showing that yesterday's was from Lowery and today's is from Artmaster. The next entry will also bear a resemblance and be from a third company. Why did so many companies make so many different envelopes for collectors? The answer boils down to marketing. Selling to philatelists - i.e. stamp collectors - is much more profitable when you can find ways to persuade a collector to buy the same stamp over and over again. The trick is to create demand for a different product using the stamp. Each different commemorative envelope was another potential sale of the stamp. Many collectors of anything have a tendency to be "completists" - if an item being collected has four variations, for instance, the completist will want to acquire the full set of four. With lots of different cachets, there were more ways to entice the buyer to purchase another Moina stamp. Some were issued by large companies, others manufactured by small dealers, making some cachets scarcer and thus more desirable, so a higher price could be charged. Many manufacturers also produced more than one envelope design. Some designs were deliberately done in small runs, so scarcity could justify charging a higher price, or so that a limited special series could be available as a premium for special collectors. When you look at the variety of cachets, that some were deliberately produced in limited runs, and that some collectors used envelopes they drew designs on themselves, it makes cataloguing the complete set of Moina cachets impossible. There isn't even a complete catalogue listing of every design or variation that the bigger manufacturers produced. That creates a situation for a scam some dealers practice today - though "scam" is probably too harsh a word, because it's perfectly legal, and because a few dealers are up front about it. With tomorrow's cachet, I'll warn you about how new Moina cachets are still being created today, 67 years after the stamp was issued! Another fine printed envelope, showing what can be done with a single color of ink and shading. I probably shall emphasize several times over the course of this series that their is no definitive list or catalogue of authentic period Moina first day cachets, i.e. 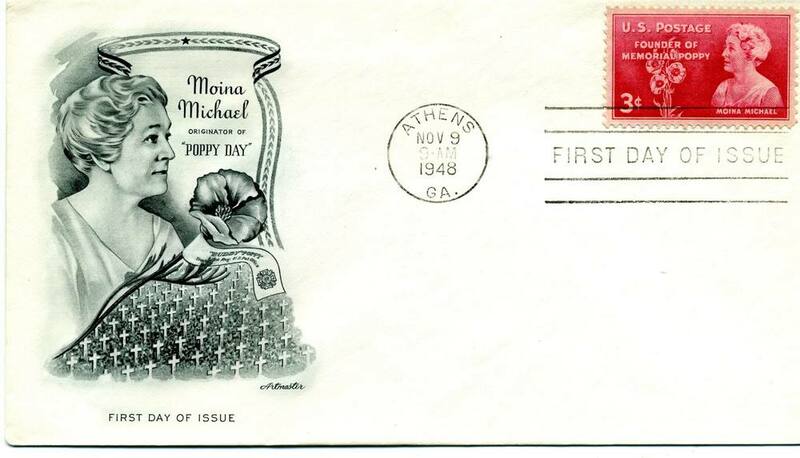 printed or decorated envelopes prepared prior to November 9, 1948 and postmarked on that date with the First Day of Issue postmark over the Moina stamp. Even the largest and most reputable dealers created special cachets, or variants of their main cachet, in very limited runs for special customers, and did not advertise them widely. Subsequent attempts to catalogue all cachets missed them. And there's no way to account for individuals who uniquely decorated their envelopes before they sent them to the postmaster for cancellation on the day of issue. Their was also no requirement that a collector buy a pre-printed envelope for a dealer, or that the envelope be decorated at all. Any self-addressed envelope submitted with the proper payment for postage would be stamped, cancelled "First Day of Issue" by the postmaster, and mailed back on the date of issue. It's also possible to present unaddressed, undecorated envelopes in bulk to the postmaster, and pay to have them stamped and cancelled. The existence of a large number of undecorated Moina First Day cachets that were stamped and cancelled on November 9, 1948, means that newly decorated can still be produced today. A dealer simply acquires a blank cancelled envelope, and decorates it either by hand or with a color printer. The result is that it is quite possible to buy a Moina cachet that didn't have a commemorative design at the time, but has had one recently added. As long as the dealer doesn't forge a prior design and try to pass it off as from the period, this is perfectly legal. I learned this about 2000 or 2001, while helping my mother try to collect the different designs we found on Ebay. Once we had established a relationship with a dealer, they would often start sending us Moina envelopes on approval. As we returned more and more that we already had, we started being offered brand new designs. Especially if an envelope is hand decorated, it can be difficult to authenticate if the design is from 1948, or produced later. There *are* dealer catalogues that show a large number of known 1948 designs. But those catalogues are not complete, and can not be complete. So if your trying to collect the various pre-printed 1948 envelopes, caution is advised. One must be very alert for designs of modern manufacture. Today's envelope, and all I've posted so far, are authentic to the period. Toward the end of this series, I'll post a modern one. Tomorrow, I'll post one authentic to the period that I don't think was printed, but was decorated with a custom rubber stamp and an inkpad. I think instead of being printed, this Moina cachet may have been made with a designed rubber stamp and an ink pad. That would be cheaper to produce in some cases, and changing the color of the ink pad can be an inexpensive way to create a limited run of rarities. For me, this is not one of the most attractive covers. It might not be immediately obvious that the red blur on the left is two poppies and not a Rorschach blot. Is it just me, or does the soldier's face look a little like Henry Fonda? That would be a point in its favor. This cachet is fairly easy to find from dealers or on Ebay. The next cachet is one of my favorites: a simple design, two colors of ink, and an image that is unique in a way that may surprise you. My favorite of the ones I've shown so far. It has a pretty and fairly simple design. The maker sprung for the more expensive two colors of ink, which with the white space gives the illusion of three colors. And there is a unique design element I've never seen in any other contemporary Moina First Day cachet: the crutch. Moina cachets tend to mainly use one or more of these design elements: poppies, crosses, pictures of Moina, and/or text. Except for this cachet, the only place on these cachets that disabled veterans are represented is in the text - see the first in this series for an example. Representing the disabled veterans in the graphic elements seems to be taboo. This lovely cachet breaks the mold. I can only speculate on why the designs frequently feature the crosses of the dead but, with this exception, never illustrate a symbol for the disabled. It's a mystery that to me makes this cachet quite special. Tomorrow: a variant of this cachet that, though less pretty and cheaper to produce, is rarer and more expensive to collect. It's the Seventh cachet, only printed in a single color. That should be cheaper to print, but this Moina cachet is actually rarer and usually more expensive. You can find yesterday's lovely two color printed cover quite easily on Ebay or from dealers for anywhere from $2.50 to $10. This one is much harder to find, and expect to pay at least $5 to $10 more. 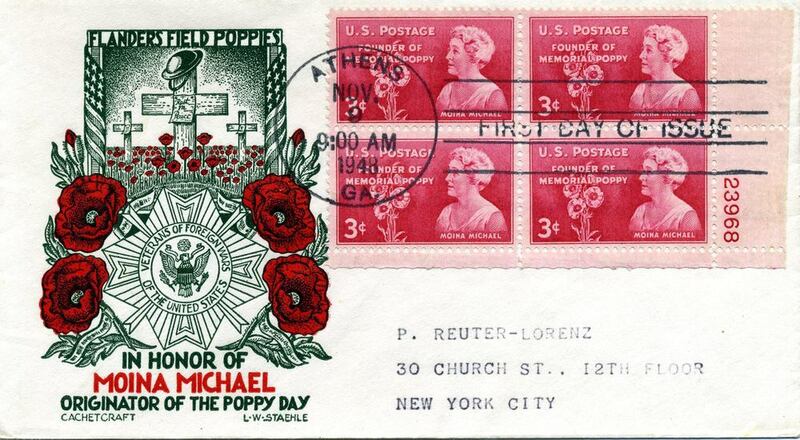 This is a single color design with graphic elements of a poppy and a field of crosses. You'll also notice that instead of a single stamp, a block of four was used. In stamp collecting, a block of four stamps in a two-by-two rectangle is called a "plate block." Plate blocks are yet another way to sell the same stamp to collectors multiple time. There are three general ways to buy a commemorative stamp: as a full sheet of stamps, as a plate block, or as a single stamp. Some collectors specialize in only collecting plate blocks. Not all plate blocks are equal. Ones taken from the corners of the sheet, with the two straight edges of the sheet still attached, are more desirable. Plate blocks with a single straight edge are also more desirable, and ones with the edge bearing the plate number of the sheet are highly desired. I'll show examples of all of those in this series. This is just a simple, basic plate block. Shown here in black, this design was also printed in at least two other colors of ink. The truth of this statement will be demonstrated over the next two entries. Here's the previous design again, but in blue. This also has a single stamp, where the prior entry had a plate block. Next, we'll do this again, but in red. A red variant of the cachet we've looked at the last two entries, with a plate block of Moina stamps. From the regular spacing of all three of these covers, it appears these were printed., not rubber stamped. The maker decided to make the same cachet in at least three colors. All three seem fairly easy to find; price ranges on all three run from about $1 to $5. A poppy in red and the text of "In Flanders Field" in blue. For me, the most impressive thing about this one is the detail and thought they put into the poppy. This cachet used a special thick ink, so that it has an effect known as "raised printing." That doesn't really show up in the scan. Note the World War I tank. Tanks were invented to try to end the stalemate of trench warfare on the Western Front. After an inauspicious trial run at the Battle of the Somme, the British finally figured out the best tactics for using them. The tank breakthrough at the 1917 Battle of Cambrai presaged the modern era of mobile warfare. Lovely two-color design with twin poppies framing the text. A photo of Moina and a plate block of stamps. 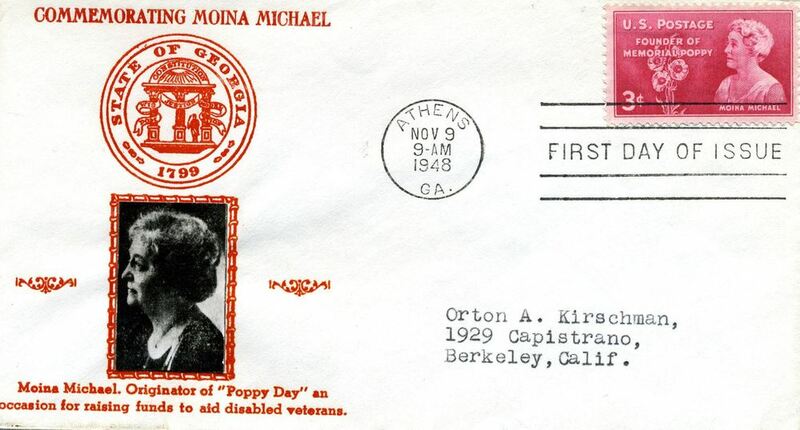 A single color graphic of Moina, poppies, and crosses with a plate block of stamps. The most colorful Moina cachet that has been posted, so far. Three basic graphic elements: text, text bordered by poppies, and a blue half-tone image of Moina bordered by a red design. It looks just like the previous entry, except the text bordered by poppies has been moved to the bottom. This is the only Moina First Day Cover to feature her book, The Miracle Flower (TMF). TMF was self-published in 1941, though the first part - Moina telling how she got the idea for the poppy - seems to be adapted from articles she originally wrote for the American Legion in the mid-1920's. TMF is the major source for biographical information on Moina. This is a green and red design that honors the Veterans of Foreign War and Moina Michael, with some poppies thrown in. As nice as the design is, the plate block of stamps is equally interesting to the collector. Note that both the bottom and right straight edges of the sheet of stamps are still attached. That means this block of four was the lower right corner of the sheet, and corners of the sheet are the most desirable for collectors. On the right, you also have the plate number of the sheet in red. This particular plate block really adds to the value. Expect to see this cachet with a single stamp, or an ordinary plate block, on sale for about $2.00 to $5.00. With a corner plate block and plate number on the stamps, this would sell in the $15.00 to $25.00 range. Another four color cachet. Note the graphic image of Moina, as it will reappear tomorrow in an otherwise different design by the same artist. Way back on #7 I said that the crutch graphic on that one was the only graphic reference I'd seen to disabled soldiers. That's my bad, as I'd completely forgotten about this cachet, which has a graphic of a nurse pushing a smiling soldier in a wheelchair. We have the same artist from the previous design, and the very same graphic of Moina, but with other design elements, and only two colors of ink. Though less expensive to produce than the previous cachet, I find this one the more attractive of the two. This cachet was made in two parts. 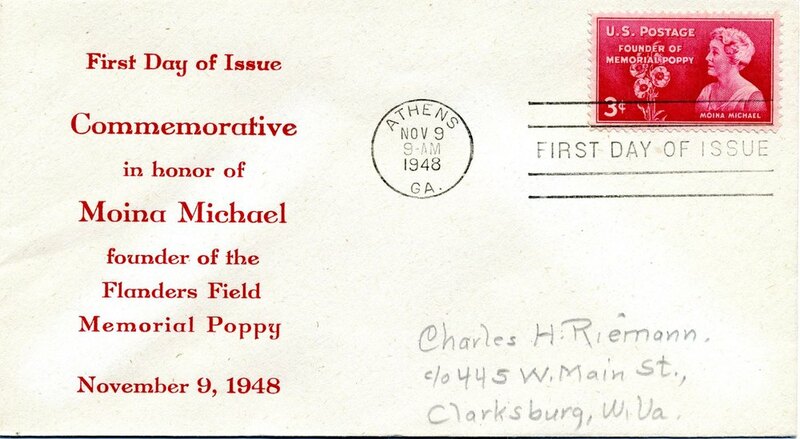 First, everything in red ink - the text, border, and poppies - was printed on the envelope with a raised ink effect. Then, the photo of Moina was glued on inside the border. This cachet has many points of interest. First, while several cachets quote "In Flanders Fields," this is a unique one that instead quotes Moina's reply, "We Shall Keep the Faith." Second, it misquotes that poem. Moina wrote "We wear" instead of "We'll wear," "ye" in place of "you" in both instances, and "lesson" not "lessons." Third, it has the dates of her birth and death incorrect. They should be "1869-1944" instead of "1870-1940." Fourth, the stamp is taken from the right edge of the sheet. Note that the right edge is still attached. Finally, back on #22 I mentioned in a comment there was something different about that cachet that we hadn't seen so far in this series. We see it again here, and it's easier to spot this time. Look at the circular part of the post mark that contains the location, date, and time. The circle is twice the diameter of the circle in the postmarks we've usually seen. This cachet, and the cachet from #22, are the only two I have so far with this larger postmark. I have no idea what significance this has, if any. In my opinion, one of the better black-and-white ones. A two-color cachet with a drawn portrait of Moina. A simple design, in three colors, with a raised ink effect. This simple single-color design was created and sold by a Detroit area stamp dealer named Oswald Ludwig. Like most other dealers, Ludwig both sold his cachets in advance to collectors who would send them to the originating post office for cancellation, and would also send some cachets to the originating post office himself to keep for sale later. Unlike most dealers, though, he wouldn't pay a little extra to have the cachets he sent himself returned to him unaddressed and in bulk in a box. Instead, he saved a little overhead by having every cover individually mailed back to himself. A lovely three-color design honoring Moina. No graphics, just text. The Joe Friday of cachet's: "Just the facts." As with #25, this cachet is a red printed design, with the photo of Moina cut out from thicker material and pasted to the center of the square. Given that this design is crooked on the envelope - the top line of the design is not even close to parallel with the top edge of the envelope - I strongly suspect this one wasn't printed, but made with something akin to a stamp and an ink pad. The thick, "raised" ink was used. This is the rarest Moina cachet I own. Dallas Pierce was a collector who was just starting to design First Day Covers in 1948. He produced a limited number of Moina cachets as a trial, and sent them to various collectors, dealers, and publishers to try to drum up publicity and interest. This particular one was sent to the editor of Linn's Stamp News, which is still the major publication for philatelists. The red graphic seems to have been produced separately from the text. Two stamps or woodblocks were used, and he didn't get the spacing quite right. I paid $14.95 for this. It's not especially valuable despite its scarcity, as it is uncatalogued. For collectors to drive the price up, they have to know about an item. There is one Moina cover that is cataloged and particularly rare - only twelve were made - that goes for between $500 and $1,000 on the very rare occasions one comes up for sale. I saw a black and white photo of one once, and it did not strike me as very pretty. The high price of that cachet is driven by the scarcity, and that collectors know about it and so desire it. A two-color design with the poetry quote being from Moina's "We Shall Keep the Faith" instead of "In Flanders Fields." The tag at the bottom indicates this cachet was distributed by the Athens Hardware Company, though it was bought by someone out of state. This cachet is fairly easy to find, and until very recently every one I've seen had the "Athens Hardware Company" tag at the bottom. In early July, 2015, I discovered my 91-year-old aunt, who had been a favorite of Moina's as a child, had two covers that were identical to this except that they were missing the "Athens Hardware Company" language. Both had been mailed by my grandmother, who lived in Athens, to other relatives in Athens. 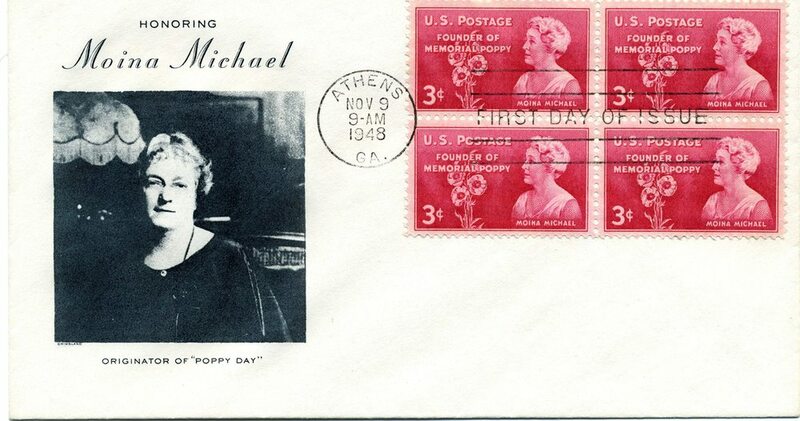 My conclusion is that the two variants were the cachets most widely available to local Athenians who wanted a keepsake to honor the day Moina Michael was commemorated on a postage stamp. More research is needed to determine the full story. he post office would accept any envelope for a First Day of Issue cancellation on the Moina stamp. Here is some proof of that assertion. The first is a collector who got all his First Day Covers made on his business stationary. This is unusual in a couple of respects: not only is it an advertisement for a product I doubt Moina would have thought highly of, but it has no address, which means the collector eiher had to present it in person, or it was part of a larger series cancelled and shipped back in bulk. Perhaps some beer distributor wanted to use Moina First Day Covers as premiums for his customers? My mind boggles. 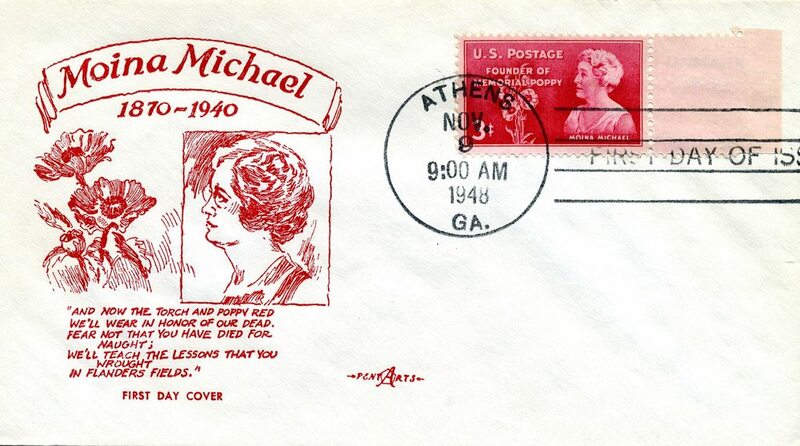 Around 2001, when I was helping my mother collect these Moina Michael covers, we got on friendly terms with a dealer we hoped would help us fill holes in the collection. He sent us this one along with some others, which we bought. It was later we realized that this was a modern cachet, with the graphic done on a modern ink jet printer. The cancellation, stamp, envelope and address are authentic. The cover must have been originally blank, without a design. It stayed that way from 1948 until 2001, when someone created this design and added it to the cover with a computer and printer. As the dealer kept offering us covers like this, and we were (and I am) only interested in designs created in 1948 to honor Moina, we eventually stopped dealing with that dealer. He never claimed these were from 1948; he only sent them without comment, and hoped we would buy. Some he had created were very lovely, including one with hand-painted poppies that I recently saw him put on Ebay asking $150 each. I post this one as a cautionary tale for those seeking to collect historical tributes to Moina: not all cachets are historical from 1948, and modern cachets can still be made. With covers that look like they have modern printing, or which have been hand-drawn, a healthy dose of suspicion may be warranted.